A bird flew against the living room window this morning. The poor thing left a feather smooshed against the glass, and then it huddled under a little table on the front deck. The cat had been sleeping on the rocking chair by the window, and her eyes became as big as dinner plates, and I swear she never blinked or took her eyes off that bird for 10 minutes. Then she crept up to the window and went eyeball to eyeball with the robin. I don't think it freaked the bird out too much though, as it probably had a massive headache, and I think by then it had figured out that the window was rather impermeable. 20 minutes later the bird had disappeared. Except for the feathers stuck on the window. The other bird (aka turkey) has been in the oven for 2 1/2 hours now and the smell is driving me crazy! I know other people often have lamb or ham for Easter dinner, but we had lamb last night and none of us are too wild about ham. But turkey!!!!!!!! I could eat turkey every day. Six kgs (that's about 14 lbs) for three people ... do you think that will be enough? Leftovers are very important with turkey, you know. With any luck I won't have to cook supper all week. Except that I know somebody will be bitching about it by Tuesday. Eva's Easter basket had the new NME in it, with Thom Yorke's face on the cover. She was thrilled to crawl out of bed to be met by the vision of over-sized Thom glaring at her (actually she was). The unsightly ginger fuzz that was threatening to take over his face seems to have been reigned in somewhat. He looks rather pretty again. Trailer Park Boys starts a new season tonight! Apparently Bubbles will open up a theme park for his kitties. And Canada Reads starts tomorrow!!!! 11:30 am every day this week on CBC Radio 1. John K Samson (the Weakerthans) is advocating for Meriam Toews' A Complicated Kindness (my favourite book that I read last year) and Scott Thompson (Kids in the Hall) is pitching Mordecai Richler's Cocksure. It's going to be GREAT! More details tomorrow. OMG new Trailer Park Boys. DROOL. So excited. Happy Easter, we're having turkey as well. My Easter basket had a Starbucks card in it. *winces* Trailer Park Boys?? I just never 'got' that show. We just had ham with all the fixings and pumkin pie. But turkey is nice too. I got a chocolate puppy for Easter. What part of a puppy does one eat first?? Stephanie, I adore Bubbles, especially because he loves his kitties so much. I'm taking a turkey sandwich to work tomorrow. You? Lucky you, a Starbucks card - that would come in very handy! Ouch Barbara W, a chocolate puppy? I wouldn't know where to begin eating that. It just seems wrong somehow. Although I am sure I would find an answer. As for TPB, if you don't like swearing, it's hard to get into the characters. Fortunately I love swearing. trailer park boys....its one that never caught on with me either.. While perusing the discount bin at a local music shop, I came across Matthew Good's "The Audio of Being" for $3. Recognizing the name from your blog, I bought it. Not bad at all. Ooo, I would have enjoyed halibut as well, Kelly! Funny thing about Trailer Park Boys - you either love it or hate it. I think it's brilliant, but that's just me. Hi Andy! Good to see you again. Hopefully your computer is all better? Very nice purchase, my dear! I'm flattered that you would buy something based on what I said. NOBODY listens to what I say haha! The Audio is Being is a really underrated cd, I think. My favourite tracks on it are Tripoli, Advertising on Police Cars, Truffle Pigs, and Sort of a Protest Song. It takes a while to grow on you, but I hope you will enjoy it. Can't go wrong for $3! Maureen, you guys are on island time. That is not such a bad thing! Poor birdie - I feel so bad for them when they wipe out on the glass, especially when they kill themselves that way. Going to see Neko Case tonight, btw. Was going to drive down to Austin tomorrow and see her there, too, but with last week's travel and everything, I'm too wiped out for another road trip, albeit a short one. I love turkey myself ... we had chicken. An issue of NME sounds like an awesome gift from the easter bunny. This one spotlights new Radiohead material? 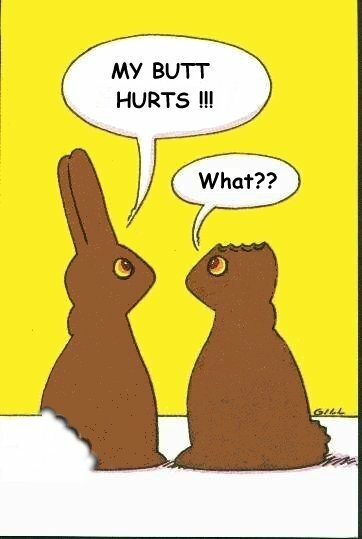 Happy Monday after Easter. ummm would i sound like an idiot if i asked what nme is? Have a wonderful time at the concert, Phlegmfatale! I can't wait to hear all about it - will you be reviewing it? I would be tempted to take in both concerts as well, but you must be pretty tired after your travels. Will, chicken is pretty much as good as turkey. I love them both. Yes, the Easter bunny hopped by the newsstand on the way to our house. New Radiohead material featuring Thom at his vitriolic best! HMAE to you too! Kelly darling, you could never sound like an idiot! NME stands for New Musical Express; it's a weekly music magazine from the UK. Yeah, Stephanie, I wanted more kitty daycare too. Next week, hopefully!